With the right features and functionalities, a clinical communication and collaboration platform is a powerful antidote to physician burnout. It dramatically improves a physician workflow by allowing them to be very specific about who can contact them, for what reason, and when. It provides rapid access to the EMR without logging in and provides direct access to colleagues inside and outside the hospital setting. Fast, intuitive communication tools allow physicians to catch infection earlier, provide consults sooner, coordinate safe patient handoffs, find on-call colleagues instantly, and turn convoluted communication processes into one-step tasks. Efficient communication, productive care teams and happier physicians all have different impacts on patient satisfaction, wellness and throughput. Physicians often fear that new technologies will slow them down, increase their workload or threaten their clinical autonomy. Your clinical communication and collaboration platform partner is uniquely positioned to meet the needs of physicians by incorporating best-practice workflow expertise to help encourage physician buy-in. Clinical communication and collaboration solutions must demonstrate that they match or improve a physician's current workflow, are easy to use, and help physicians provide better care for patients. Having rolled out hundreds of clinical communication and care team collaboration solutions across the U.S., this guide demonstrates the essential ingredients for driving physician adoption, while ensuring value to hospital administrators. Complete this form to receive the guide. 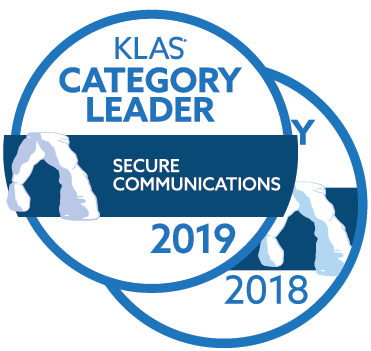 Telmediq is the 2019 & 2018 KLAS Category Leader for Secure Communications Platforms. Allow us to streamline your clinical communications and workflows so you can improve physician satisfaction, patient care and patient safety. "Most of the time when hospitals implement new technology, and if it's implemented for compliance reasons, it's not asked for," says Dr. Perkins of Greenville Health System. "With Telmediq, when people hear about it, they want it now."